Every local business wants to rank higher in google’s local map listings. This is easier said than done for most. The reason is because, how to get there, is hard to understand and by the time you figure it out, Google goes and changes it all. Here are the basics of the local map results in Google, that you can depend on not going away for a while. To rank for “plumber in Seattle”, your website needs to be about the plumber topic. This is pretty obvious, but it’s not just the outside that needs to be about plumbers, the website must to be optimized to target the topic. More content on this general topic and more content on related topics needs to be added to the site. 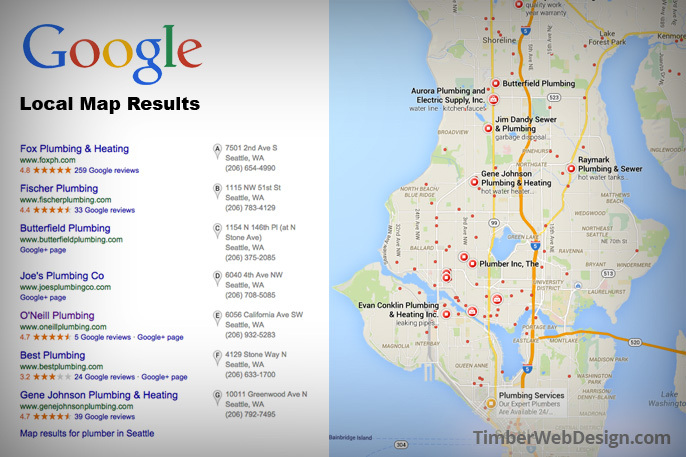 Google’s local map listings display results are also based on the distance between the user that is searching for a plumber and the Plumber’s published location. A Google+ business page is a must. If you do not have one yet, you need one, yesterday. The key is to make sure that the address on the Google+ page and your website, match exactly. If it says Rd. rather than Road, you have to make it match exactly. Same with company name and phone number. These 3 items need to be exactly the same across all the published information about your business online, company name, address and phone number (NAP). Prominence – “prämənəns” – The state of being important or famous. All this means is that your site’s importance or famousness is another metric Google uses to determine how high to place your listing in the local map results. This one is very tricky, because there are so many right ways and wrong ways to change your website’s prominence. Today, I want to tell you what Google wants, and if you grow the prominence of your site with that in mind, your site should never get slapped by Google. Google wants quality, useful content for it’s users. It wants to provide the most useful information that fits the searcher’s query as close as possible. If you help them achieve this goal, Google will love your website. How do you do this? By creating original, quality content, that is useful, and then spreading it across the Internet, linking back to your website. If you are a plumber, write a great piece of content about plumbing fixtures and send it to the editors of a local hardware store website. Write up a press release about something exciting happening with your company (something exciting to everyone, not just to you), and send it to a local newspaper, or a local online news website. Get your content published on other websites and collect links to your site from them. The other very important step is to make sure that you are listed in as many online local business directories as you can. Find popular business directories and add your listing there. Make sure that your NAP matches exactly in each listing. That’s it. If you follow these 3 steps, you will be ahead of most of your competition. The fact that you are looking into this stuff is already a step many of your competitors will not even bother to do. Don’t give up on this, create a step by step plan for your self and follow it to complete the 3 steps I explained in this post. Have questions about this? Just ask them in the comments.